Our Lady of Lourdes recap and photo gallery. West Philly! More specifically, 63rd & Lancaster Avenue. Overbrook’s Our Lady of Lourdes (OLL) serves as a reminder that churches don’t need to be larger than life. Sure, it’s impossible to argue with something like Immaculate Conception. But while grandiosity is good, it’s not everything. As St. Veronica, St. Michael and St. Augustine proved, a church can be terrific without blocking out the sun. You can now add Our Lady of Lourdes to that list. The church isn’t big by any means — in fact, it’s really rather shrimpy — but it’s classically, strikingly beautiful. 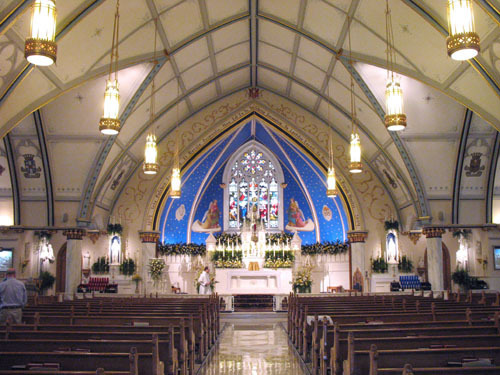 The cruciform gothic design is dressed up in a gorgeous blue, gold, and white color scheme, particularly around the altar. True to Gothic form, the stained glass windows are huge and magnificent. Oh, and like Our Lady of Mount Carmel (OLMC) it uses a stained glass window as an altar backdrop. There are a couple of places where the paint job seems to get a little OLMC-y, and the design does look a little vertically squashed. Overall, though, this is a really terrific décor. The real joys here are the little touches — the gleaming gold candelabras, the gold bars holding the altar rug in place, the various painted crests on the ceiling. I called it classically beautiful for a reason; the place has an old-school, traditionalist vibe. Look for it: The statue outside of St. Michael stepping Lucifer’s head. Michael’s sword looks like it broke off long ago, but it’s still pretty cool. The Project likes tradition. And the Project likes this church. That traditionalist vibe extends to the parish itself. Our Lady of Lourdes is notable for being very old-school in its ways. It actually offers masses in the traditional Tridentine style, as well as a solemn sung latin. Catholicism has seen a minor push to reinstate some of the old ways, but you actually see very little of it. OLL is one of only a few churches that actually walks the walk. That has paid off for the parish, which seems fairly healthy despite some wildly fluctuating attendance numbers. And with the 2013 absorption of neighboring St. Callistus and St. Donato, it's clear the AD is doubling down on this location. Of course, if you still don't believe me, look at the church itself. Think that décor is original? Guess again. Our Lady of Lourdes was actually really scuzzy as recently as a few years back. They not only managed to repair all of the damage, but they did so as part of a beautiful renovation that avoided the Tabula Rasa stench and managed to fool a newcomer into thinking it was original. That's all kinds of impressive right there. OLL is on the western edge of the city, right beyond the City Ave. border. City Ave is, as usual, a complete disaster, so you should take another route if possible. The church's Overbrook location straddles a weird twilight zone between nicer areas to the north and shadier areas to the south. Regardless, you shouldn’t have any problems. Even the holy water fonts by the entrance are small. They’re in the shape of petite angels that are barely a couple of feet high. You actually need to bend over to use them. I’m willing to overlook size only so far; this is just ridiculous. Did midgets build this place? The self-proclaimed “Gateway Parish to West Philadelphia” is well worth your time. Recommended. (c) Copyright 2007-Present, Philadelphia Church Project. All rights reserved.